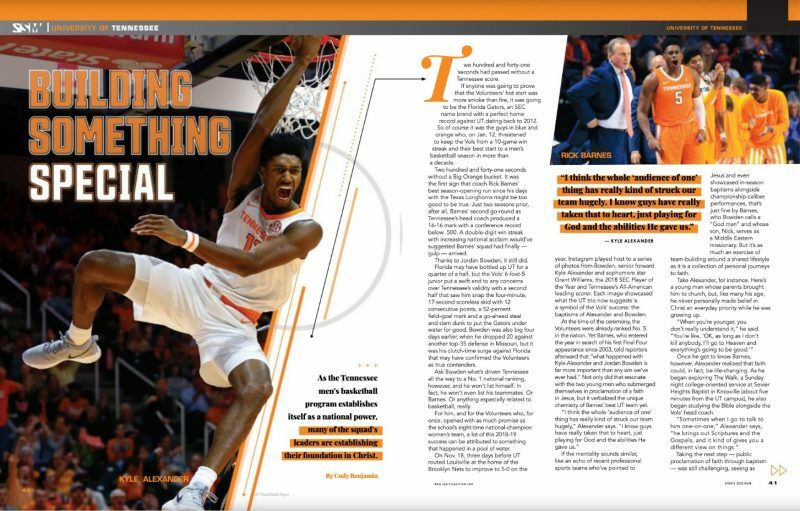 AS THE TENNESSEE MEN’S BASKETBALL PROGRAM ESTABLISHES ITSELF AS A NATIONAL POWER, MANY OF THE SQUAD’S LEADERS ARE ESTABLISHING THEIR FOUNDATION IN CHRIST. Two hundred and forty-one seconds had passed without a Tennessee score. Two hundred and forty-one seconds without a Big Orange bucket. It was the first sign that coach Rick Barnes’ best season-opening run since his days with the Texas Longhorns might be too good to be true. Just two seasons prior, after all, Barnes’ second go-round as Tennessee’s head coach produced a 16-16 mark with a conference record below .500. A double-digit win streak with increasing national acclaim would’ve suggested Barnes’ squad had finally — gulp — arrived. Thanks to Jordan Bowden, it still did. Florida may have bottled up UT for a quarter of a half, but the Vols’ 6-foot-5 junior put a swift end to any concerns over Tennessee’s validity with a second half that saw him snap the four-minute, 17-second scoreless skid with 12 consecutive points, a 52-percent field-goal mark and a go-ahead steal and slam dunk to put the Gators under water for good. Bowden was also big four days earlier, when he dropped 20 against another top-35 defense in Missouri, but it was his clutch-time surge against Florida that may have confirmed the Volunteers as true contenders. Ask Bowden what’s driven Tennessee as high as a No. 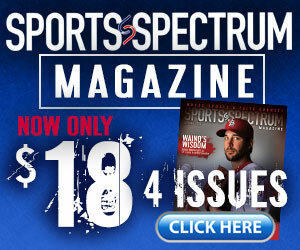 1 national ranking this season, however, and he won’t list himself. In fact, he won’t even list his teammates. Or Barnes. Or anything especially related to basketball, really. For him, and for the Volunteers who, for once, opened with as much promise as the school’s eight-time national-champion women’s team, a lot of this 2018-19 success can be attributed to something that happened in a pool of water. 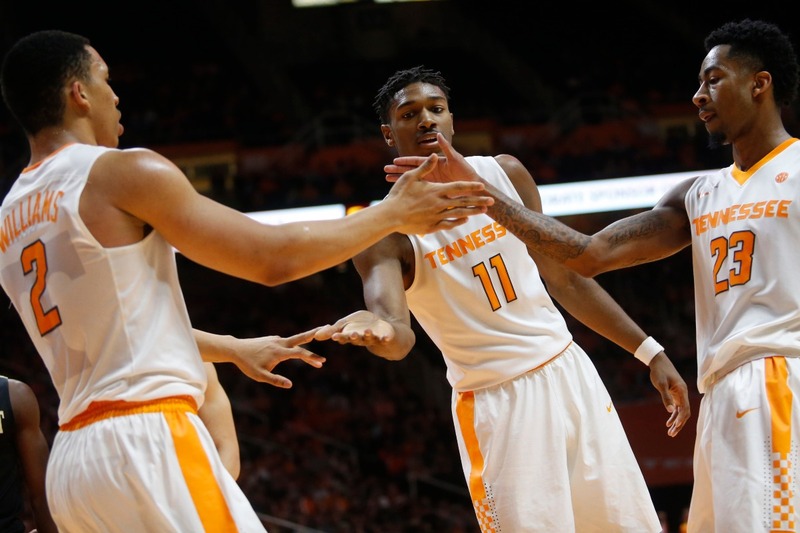 On Nov. 18, three days before UT routed Louisville at the home of the Brooklyn Nets to improve to 5-0 on the year, Instagram played host to a series of photos from Bowden, senior forward Kyle Alexander and sophomore star Grant Williams, the 2018 SEC Player of the Year and Tennessee’s All-American leading scorer. Each image showcased what the UT trio now suggests is a symbol of the Vols’ success: the baptisms of Alexander and Bowden. At the time of the ceremony, the Volunteers were already ranked No. 5 in the nation. Yet Barnes, who entered the year in search of his first Final Four appearance since 2003, told reporters afterward that “what happened with Kyle Alexander and Jordan Bowden is far more important than any win we’ve ever had.” Not only did that resonate with the two young men who submerged themselves in proclamation of a faith in Jesus, but it verbalized the unique chemistry of Barnes’ best UT team yet. If the mentality sounds similar, like an echo of recent professional sports teams who’ve pointed to Jesus and even showcased in-season baptisms alongside championship-caliber performances, that’s just fine by Barnes, who Bowden calls a “God man” and whose son, Nick, serves as a Middle Eastern missionary. But it’s as much an exercise of team-building around a shared lifestyle as it is a collection of personal journeys to faith. Take Alexander, for instance. Here’s a young man whose parents brought him to church, but, like many his age, he never personally made belief in Christ an everyday priority while he was growing up. Once he got to know Barnes, however, Alexander realized that faith could, in fact, be life-changing. As he began exploring The Walk, a Sunday night college-oriented service at Sevier Heights Baptist in Knoxville (about five minutes from the UT campus), he also began studying the Bible alongside the Vols’ head coach. Taking the next step — public proclamation of faith through baptism — was still challenging, seeing as though Alexander didn’t grow up knowing and, thus, talking about Jesus. But that’s where community came in, and his community just so happened to be his fellow Volunteers.